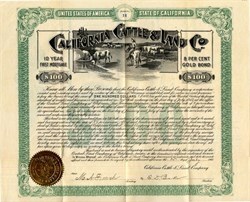 Beautiful certificate #14 from the California Cattle & Land Co dated in 1903. This historic document has an ornate border around it with an unusual vignette of vignette of cowboys hearding cattle. White paper with green underprint, black vignette and lettering and gold seal. 14 four dollar coupons attached at bottom. 14 3/4" x 16 3/4". This item has the signatures of the Company's President, E. D. Baker and Secretary, M. A. French and is over 105 years old.